Lets face it, your asked for identification when your traveling with your service dog. No it is not a requirement, but that is not the problem, the problem is getting through your day with as little hastle as possible. 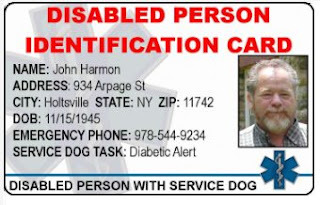 We have created this Disabled Person Identification Card specifically for service dog handlers so that the question that is allowed to be asked is answered on your ID card. The back of the card has a US Federal Law notice. What task does your service dog provide? It is the "proof" that they are looking for.